Two Hot Pink and Zebra Faux Fur Throw Pillow, Pillows, New! 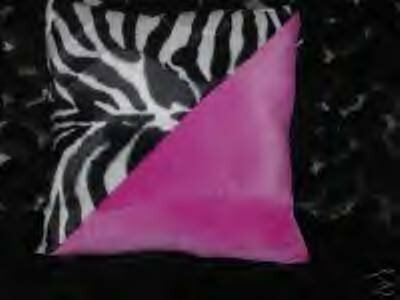 Two handmade hot pink and zebra faux fur throw pillows measuring 16"x16" from seam to seam using the split design and have faux fur reverse side. You can't go wrong with these. Pillows are filled with 100% poly fiberfill, new, never been used. Washable and dryable on gentle cycle and low heat. Other sizes are available upon request. Contact me for info on sizes and price. Also available are custom made throw blankets, plus bedspreads to fit twin, full, queen and king size beds, pillow shams, pillows of all sizes and shapes, curtains, valances, duvet covers and pillow cases. Thank you for looking! Two Snow Leopard Faux Fur Throw Pillow, Pillows, New! Black and White Zebra Wide Stripe Faux Fur Throw Blanket, New! Two Leopard Faux Fur Throw Pillows, Pillow, New! Two Red, Black & White Zebra Faux Fur Throw Pillow, PIllows, New! Two Black Faux Fur Thow Pillows, Pillow, New!